With inflation coming in above 2% last month, the Fed could soon boost interest rates for the third time since the financial crisis. The good news keeps rolling in for bank stocks, with the U.S. Labor Department reporting today that consumer prices increased in December by 2.1% compared to the same month in 2015. Granted, this may not seem like good news. After all, isn't inflation bad? The answer is: yes and no. Inflation is similar to the porridge in the story of Goldilocks and the Three Bears. You neither want too much nor too little. You want just the right amount. The magic number, according to the Federal Reserve, is 2%. If consumer prices increase at a slower pace than that, it suggests that the economy isn't growing as fast as monetary policymakers think it should. 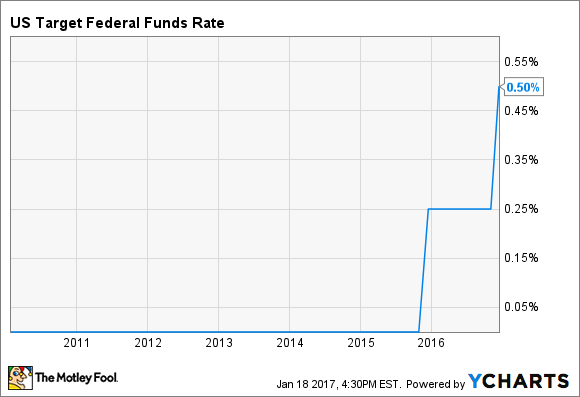 And if prices rise at a quicker pace than 2%, then the Fed will begin to rein in the trend by increasing interest rates. Data source: U.S. Labor Department. Chart by author. Herein lies the reason why the latest inflation estimate is such good news for banks, particularly asset-sensitive banks such as Bank of America (NYSE:BAC) and JPMorgan Chase (NYSE:JPM) that are especially sensitive to changes in interest rates. Since the financial crisis, short-term interest rates have hovered near 0% until just recently. The Fed has kept rates low in an effort to spur the economy by minimizing the cost to borrow, thereby encouraging consumers and businesses to buy things on credit. By doing so, the Fed has achieved one of its two congressionally mandated objectives: to maximize employment. The unemployment rate in November was only 4.6%. It climbed to 4.7% in December, but it's still comfortably below the central bank's 5% target. One consequence of the Fed's strategy, however, is that it's weighed heavily on bank earnings. Because banks sell money by making loans, lower interest rates translate into lower revenue for banks. As interest rates rise, by contrast, the price of money does, too, followed in lockstep by revenues and profits in the bank industry. But while the Fed's employment mandate has been achieved, its inflation mandate, to keep inflation at or around 2%, has not. This is why it's only raised the fed funds rate, the primary short-term interest rate benchmark in the United States, twice since the financial crisis eight years ago, most recently last month. And it's done so for a total of just 50 basis points, or 0.50%. It remains to be seen whether December was an anomaly, or if the faster rate of inflation is sustainable, as we've seen inflation briefly eclipse 2% on multiple occasions over the past few years. With the exception of 2015, in fact, it's done so at least once every year since 2010. If it is sustainable, banks will soon make a lot more money because the Fed has been waiting for inflation to pick up before raising rates. Compared to last year, Bank of America's net interest income could grow by more than $5 billion over the next 12 months. And JPMorgan Chase isn't far behind Bank of America. Based on its own interest rate sensitivity analysis, JPMorgan's annual net interest income would likely gain around $3 billion on a year-over-year basis.